Today, you can utilize multiple network nodes to achieve load sharing, but not high availability or redundancy. Assuming three network nodes, creation of new routers will be scheduled and distributed amongst those three nodes. However, if a node drops, all routers on that node will cease to exist as well as any traffic normally forwarded by those routers. Neutron, in the Icehouse release, doesn’t support any built-in solution. DHCP agents are a different beast altogether – The DHCP protocol allows for the co-existence of multiple DHCP servers all serving the same pool, at the same time. You will change the DHCP scheduler to schedule X DHCP agents per network. So, for a deployment with 3 network nodes, and setting dhcp_agents_per_network to 2, every Neutron network will be served by 2 DHCP agents out of 3. How does this work? First, let’s take a look at the story from a baremetal perspective, outside of the cloud world. When the workstation is connected to a subnet in the 10.0.0.0/24 subnet, it broadcasts a DHCP discover. Both DHCP servers dnsmasq1 and dnsmasq2 (Or other implementations of a DHCP server) receive the broadcast and respond with an offer for 10.0.0.2. Assuming that the first server’s response was received by the workstation first, it will then broadcast a request for 10.0.0.2, and specify the IP address of dnsmasq1 – 10.0.0.253. Both servers receive the broadcast, but only dnsmasq1 responds with an ACK. Since all DHCP communication is via broadcasts, server 2 also receives the ACK, and can mark 10.0.0.2 as taken by AA:BB:CC:11:22:33, so as to not offer it to other workstations. To summarize, all communication between clients and servers is done via broadcasts and thus the state (What IPs are used at any given time, and by who) can be distributed across the servers correctly. In the Neutron case, the assignment from MAC to IP is configured on each dnsmasq server beforehand, when the Neutron port is created. Thus, both dnsmasq leases file will hold the AA:BB:CC:11:22:33 to 10.0.0.2 mapping before the DHCP request is even broadcast. As you can see, DHCP HA is supported at the protocol level. L3 agents don’t (Currently) have any of these fancy tricks that DHCP offers, and yet the people demand high availability. So what are the people doing? Pacemaker / Corosync – Use external clustering technologies to specify a standby network node for an active one. The standby node will essentially sit there looking pretty, and when a failure is detected with the active node, the L3 agent will be started on the standby node. 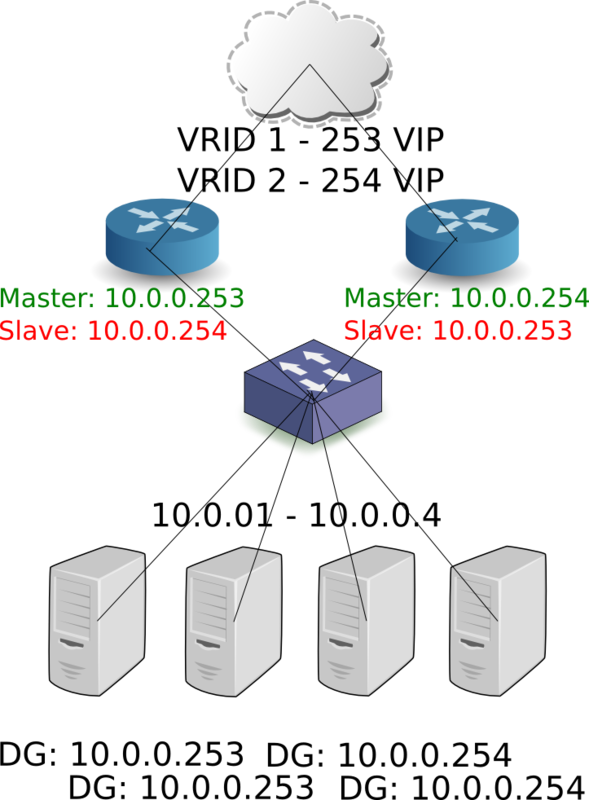 The two nodes are configured with the same hostname so that when the secondary agent goes live and synchronizes with the server, it identifies itself with the same ID and thus manages the same routers. Another type of solution writes a script that runs as a cron job. This would be a Python SDK script that would use the API to get a list of dead agents, get all the routers on that agent, and reschedule them to other agents. In the Juno time frame, look for this patch https://review.openstack.org/#/c/110893/ by Kevin Benton to bake rescheduling into Neutron itself. All solutions listed suffer from a substantial failover time, if only for the simple fact that configuring a non-trivial amount of routers on the new node(s) takes quite a while. Thousands of routers take hours to finish the rescheduling and configuration process. The people demand fast failover! The gist is that it moves routing to the compute nodes, rendering the L3 agent on the network nodes pointless. Or does it? Ideally you would use DVR together with L3 HA. Floating IP traffic would be routed directly by your compute nodes, while SNAT traffic would go through the HA L3 agents on the network nodes. The Juno targeted L3 HA solution uses the popular Linux keepalived tool, which uses VRRP internally. First, then, let’s discuss VRRP. What is VRRP, how does it work in the physical world? Virtual Router Redundancy Protocol is a first hop redundancy protocol – It aims to provide high availability of the network’s default gateway, or the next hop of a route. What problem does it solve? In a network topology with two routers providing internet connectivity, you could assign half of the network’s default gateway to the first router’s IP address, and the other half to the second router. This would provide load sharing, but what happens if one router loses connectivity? Herein comes the idea of a virtual IP address, or a floating address, which will be configured as the network’s default gateway. During a failover, the standby routers won’t receive VRRP hello messages from the master and will thus perform an election process, with the winning router acting as the active gateway, and the others remain as standby. The active router configures the virtual IP address (Or VIP for short), on its internal, LAN facing interface, and responds to ARP requests with a virtual MAC address. 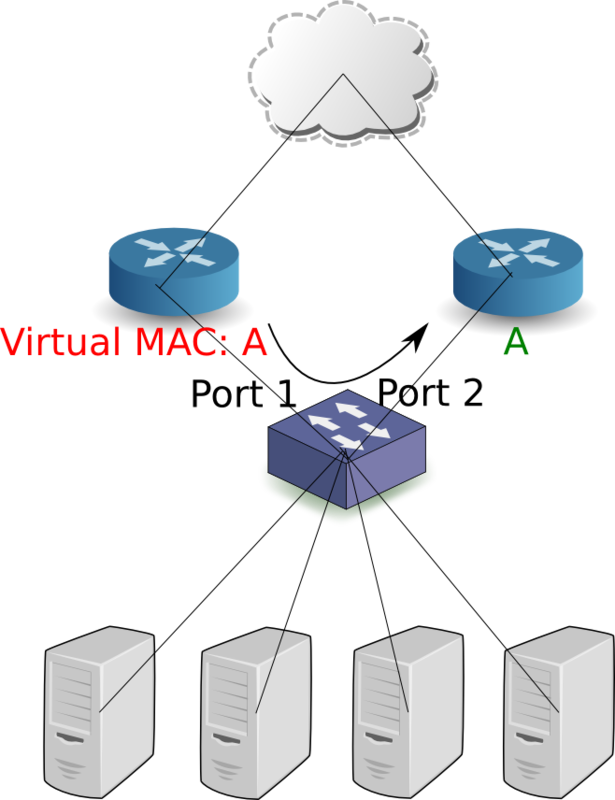 The network computers already have entries in their ARP caches (For the VIP + virtual MAC address) and have no reason to resend an ARP request. Following the election process, the virtuous standby router becomes the new active instance, and sends a gratuitous ARP request – Proclaiming to the network that the VIP + MAC pair now belong to it. The switches comprising the network move the virtual MAC address from the old port to the new. By doing so, traffic to the default gateway will reach the correct (New) active router. Note that this approach does not accomplish load sharing, in the sense that all traffic is forwarded through the active router. (Note that in the Neutron use case, load sharing is not accomplished at the individual router level, but at the node level, assuming a non-trivial amount of routers). How does one accomplish load sharing at the router resolution? VRRP groups: The VRRP header includes a Virtual Router Identifier, or VRID. Half of the network hosts will configure the first VIP, and the other half the second. In the case of a failure, the VIP previously found on the failing router will transfer to another one. The observant reader will have identified a problem – What if the active router loses connectivity to the internet? Will it remain as the active router, unable to route packets? VRRP adds the capability to monitor the external link and relinquish its role as the active router in case of a failure. Each router gets an IP address, regardless of its VRRP state. The master router is configured with the VIP as an additional or secondary address. Only the VIP is configured. IE: The master router will hold the VIP while the slaves will have no IPs configured whatsoever. The master script simply opens up the metadata proxy, and writes the state to a state file, which can be later read by the L3 agent. The backup and fault scripts kill the proxy and write their respective states to the aforementioned state file. This means that the metadata proxy will be live only on the master router instance. * Aren’t We Forgetting the Metadata Agent? Simply enable the agent on every network node and you’re good to go. TCP connection tracking – With the current implementation, TCP sessions are broken on failover. The idea is to use conntrackd in order to replicate the session states across HA routers, so that when the failover finishes, TCP sessions will continue where they left off. Where is the master instance hosted? As it is now it is impossible for the admin to know which network node is hosting the master instance of a HA router. The plan is for the agents to report this information and for the server to expose it via the API. Evacuating an agent – Ideally bringing down a node for maintenance should cause all of the HA router instances on said node to relinquish their master states, speeding up the failover process. Notifying L2pop of VIP movements – Consider the IP/MAC of the router on a tenant network. Only the master instance will actually have the IP configured, but the same Neutron port and same MAC will show up on all participating network nodes. This might have adverse effects on the L2pop mechanism driver, as it expects a MAC address in a single location in the network. The plan to solve this deficiency is to send an RPC message from the agent whenever it detects a VRRP state change, so that when a router becomes the master, the controller is notified, which can then update the L2pop state. FW, VPN and LB as a service integration. Both DVR and L3 HA have issues integrating with the advanced services, and a more serious look will be taken during the Kilo cycle. One HA network per tenant. This implies a limit of 255 HA routers per tenant, as each router takes up a VRID, and the VRRP protocol allows 255 distinct VRID values in a single broadcast domain. l3_ha = True means that all router creations will default to HA (And not legacy) routers. This is turned off by default. You can set the max to a number between min and the number of network nodes in your deployment. If you deploy 4 net nodes but set max to 2, only two l3 agents will be used per HA router (One master, one slave). min is used as a sanity check: If you have two network nodes and one goes out momentarily, any new routers created during that time period will fail as you need at least <min> L3 agents up when creating a HA router. ← Vote for OpenStack Paris sessions! I’ve got a question for you that is similar in scope. Currently in OpenStack, we use a feature that was a patch in Essex, and made it into mainline Folsom. This is where we define a gateway in the dnsmasq config on each node, using the label/tag of the network. In doing so, we use a hardware firewall for connectivity (the gateway). We haven’t (yet) found a reliable method to do this with Neutron. How would we accomplish this? If you’re interested in a hardware gateway, you can use an admin created network to assign the appropriate VLAN tag, and simply configure that subnet’s gateway to match your physical gateway. hr here should be qr. Not all DHCP is broadcast. I am testing the neutron L3 HA(using keepalived). One question is that how could it failover if ha device is still active but qg device or l3 agent is down? Currently the only way to failover administratively is to shut down the HA device. Failing over when the external device is down has an open bug: https://bugs.launchpad.net/neutron/+bug/1365461. There’s a few bugs to get to before we tackle that one, but I’m hoping to fix that for Kilo. If you want to failover if the L3 agent is down: You’d have to monitor the agent via something like Pacemaker and set it up to bring down the HA device if it detects that the agent is down.